When the sky is clear, a magnificent view from the eastern part of the Annapurna range to Gaurishanker in the east greets you when you reach the top of the hill. You can attempt these treks by yourself or you can contact Nature trail – Nepal Tour and Trekking agency. They provide a guide, local transportation, and packed lunch for the hikes and will also tailor the hikes to suit your needs. Among the many places to hike around the valley, the Changragiri trek provides some truly spectacular views and just takes a day. Situated in the south, it follows the eastern range toward the Hattiban resort. A popular starting point for this trek is Hotel Outlook Inn. The hike takes approximately seven hours with the first three hours being a steep ascend to Chhap Bhanjyang that is on an elevation of 2275 meters above sea level. This climb itself provides you with a picturesque view of snow covered mountain ranges above the Kathmandu valley. It is another almost an hour hike up to the Chandragiri hill view point. From here, you can view the mountain range, which includes, Mt. Kanchanjunga, Mt. Makalu, Saipal to Mt. Everest and Mt. Api, from the east to the west. This hike, however, does not only have the spectacular views of mountains to offer to you. You can try to identify over 135 different species of medicinal plants and do a spot of bird watching as well. There are many different species such as red-vented Bulbul, Great Egret, Grey Wagtail, Oriental Turtle Dove, Spotted Dove, and Steppe Eagle that you might be able to catch a glimpse of. The Shivapuri National park is located in the northwest part of Kathmandu. It is the second highest hill near the Kathmandu valley at an altitude of 2563m and a paradise for bird watchers. The good thing about hiking in Shivapuri area is that there are multiple options where you can hike for just two to three hours or for an entire day. It is ideal for people who cannot go for longer treks. The trek itself is through a somewhat steep dense forest from where the view of the valley starts getting magnificent. It takes about two hours to reach the top of the hill from where you can enjoy a panoramic view of the valley while you have your lunch and rest. On the trek back to the valley, you can opt to take the Sundarijal route. Sundarijal is about 15 kilometers away from the valley and you can easily find transportation back to the city. This area is famous for the waterfalls and the rivers where, if you have time, you can also enjoy canoeing. Namobuddha is situated at an elevation of 1750m and lies about 38 kilometers east of Kathmandu. You can drive from Kathmandu to Dhapasi that is around 35 kilometers east of Kathmandu. From there the hiking route heads northeast and gets narrower as you go along. This route takes you over a suspension bridge and passes through many small villages with huge rice fields. The trail goes uphill for an hour until you reach Namo Buddha. 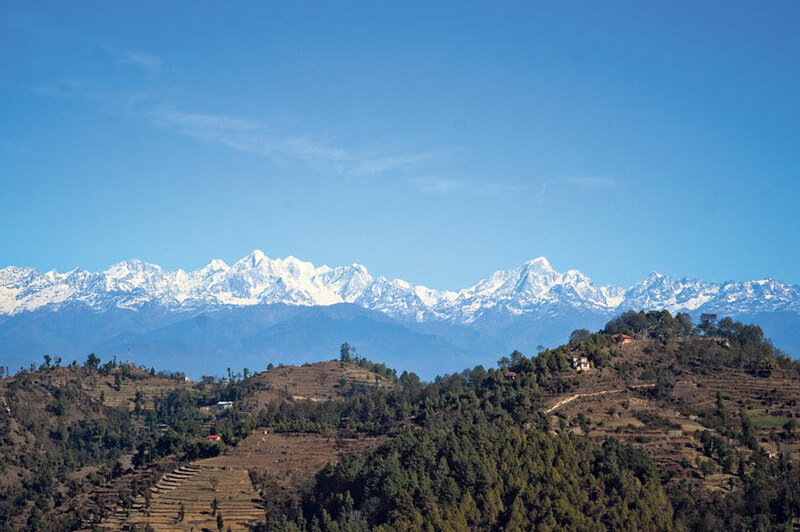 Alternatively, you can drive to Dhulikhel and climb up to the Kali temple lookout. The trail dips down to the left after the Deurali restaurant for half an hour to the village of Kavre, by the new road to Sindhuli. When you reach here, cross the road and walk down besides the prayer flags for around an hour to the village of Phulbari. As you crest the ridge, you will see a Tibetan Monastery on a hilltop with Namo Buddha just below it. The trail is equipped with signs and you don’t really need a guide for this route. Phulchowki at 2782 meters above sea level and is the highest hill in the south of the valley. This is one of the most striking hikes in terms of vegetation in Kathmandu valley. It is also famous for bird watching. The hike starts from the Royal Botanical Garden in Godavari where you gradually go uphill all the way through a sub tropical thick forest for about four hours if you walk at a moderate pace. When the sky is clear, a magnificent view from the eastern part of the Annapurna range to Gaurishanker in the east greets you when you reach the top of the hill. It also provides a breathtaking view of the valley. You can take the same route back and drive into the valley again. Champadevi is situated at an altitude of 2285 meters southwest of Kathmandu and is a pilgrimage site that has a Buddhist stupa and Hindu shrines. You can start your hike from Pharping, gradually going up for about half an hour along the trails toward the north ridge and through pine forests. From here, you continue hiking up, following the trails for about another three hours to Champadevi. The view of central and western Himalayan Ranges are magnificent from here. After resting here for a bit and soaking up the view, you can hike down to Hattiban, which takes about two hours. From here you can get a great view of the valley and the Langtang and the Ganesh mountain range. You can take a vehicle back into the city from Hattiban.